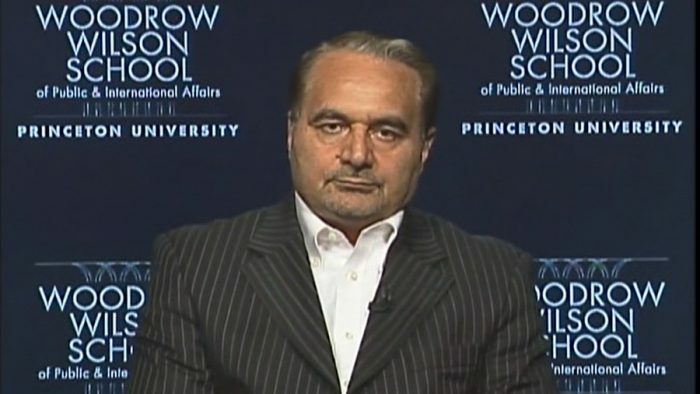 Seyed Hossein Mousavian, a former official with the Iranian regime who transplanted to Princeton University and remade himself into a scholar, has been busy advocating for his old bosses; the mullahs in Tehran. Even though he presided over various aspects of the regime’s security apparatus and was responsible for essentially hiding its clandestine nuclear program, he has worked diligently from his university perch to push the same old narratives supporting the Iranian regime. One of his most recent key messages has been to push the narrative surrounding the growing confrontations between Iran and Saudi Arabia. In an essay he wrote for the Cairo Review of Global Affairs, Mousavian dives deeply into the discussion and tries to frame Saudi Arabia’s opposition to growing Iranian influence as part of a larger U.S. security plan to maintain control in the region. “The chief rivalry in the region—between Saudi Arabia and Iran—is in fact a proxy for the competition between states seeking multipolarity (Iran) and those seeking to bandwagon off continued U.S. regional and global hegemony (Saudi Arabia),” he writes. “Given Iran’s expanding regional influence, the foremost concern of Israel, Saudi Arabia, and some other regional Arab states is that as the United States disengages from the Middle East and Persian Gulf, the subsequent vacuum is not filled by Iran and Iran’s allied powers. This worry is amplified by the fact that the Arab World is in decline and traditional Arab powers have either collapsed or are stricken with domestic crises,” Mousavian adds. He tries to make the same stale argument similarly made by other Iran lobby supporters such as Trita Parsi of the National Iranian American Council that Iran is merely filling in the natural power vacuum resulting from waning American influence and that Iran is on the ascendancy, so it should naturally take a more preeminent position. Couple this with a decaying and decadent Arab world, it makes sense for Iran to be a natural power in the Middle East according to Mousavian. Unfortunately, the reality is much different than the picture he tries to paint. Far from being a rising power that used its economic clout, political influence of even cultural impact to influence the region, the Iranian regime has instead used its Revolutionary Guards and Quds Force to militarily intervene in neighbors such as Syria, Iraq and Yemen, while it has funded and directed proxies such as terror groups like Hezbollah and Houthi rebels to topple government and carry out attacks. Far from using the financial windfall it gained from the nuclear deal to better and improve its own economy and lift the poorest Iranians, the mullahs instead opted to divert billions on a crash program to build and deploy an intercontinental ballistic missile capability that has threatened its neighbors with the prospect of weapons of mass destruction raining down on them. These are not the acts of a nation interested in being a friendly partner, but rather a brutal regime intent on subverting and controlling its neighbors in order to create an extremist Islamic version of the old Warsaw Pact to protect itself. Mousavian also touts Iran’s willingness to fight terrorist groups such as Al-Qaeda and ISIS, but neglects to mention that through its own terrorist network through Hezbollah, Iran conducts terrorist operations far from the battlegrounds of the Middle East and specifically targets and kills U.S. personnel; most recently in Iraq and Afghanistan. Appallingly, Mousavian takes Saudi Arabia to task for the conflict in Yemen, blaming it for causing a humanitarian crisis there. He attempts to draw on historical claims of Houthi governance there and that the Saudis had engineered an overthrow. What he again fails to point out is that the war in Yemen didn’t start until Iran armed Houthi rebels, supplying them with guns, mortars, rockets and communications equipment and regularly supplies them through clandestine Iranian fishing vessels; some of which have been intercepted by U.S. and Saudi navy ships. Mousavian goes on to make similar claims that Saudi Arabia is responsible for instability in Lebanon, Iraq, Egypt and even Palestine and Israel. For Mousavian, Saudi Arabia seems to be the most powerfully destabilizing force in the Middle East. About the only thing he doesn’t seem to blame Saudi Arabia and its primary patron, the U.S., for is global warming. Lastly, Mousavian takes aim at Iranian resistance groups, including the Mojahedin-e Khalq (MEK), which he claims conducts terrorist acts on Iranian soil, but also neglects to mention the long history of open warfare by the Iranian regime against its members and other Iranian dissidents; including assassinations carried out by its Quds Forces and attacks on unarmed refugees at camps in Iraq. “These realities have compelled Iran to have an active, preemptive, and deterrent role in the region in order to secure it borders, centralized governance, and national cohesion. To achieve these aims, Iran’s foreign policy goals have been centered on confronting threats, stabilizing the region, and improving its self-sufficiency in the production of weapons of deterrence, including ballistic missiles,” Mousavian claims. But ultimately Iranian regime has done little to stabilize the Middle East. In fact, since the nuclear deal, it has in fact been the chief antagonist and leading participant in the wars that have raged there. Even as of this month, the Iranian regime escalated conflicts in Syria when its forces approached a U.S. base along the Syria-Iraq border which resulted in attacks by U.S. aircraft. If any nation is interested in establishing permanent military bases far from its borders, it is the Iranian regime and the rapid pace of confrontations with the U.S., Saudi Arabia and others only underscore the regime’s willingness to up the ante in terms of spreading conflict. The real enemy isn’t Saudi Arabia as Mousavian claims, but rather the mullahs in Tehran and the Iran lobbyist that cover for them.